← 244 "Days of Wine and D'oh'ses"
The Simpsons are barefoot, quickly walking across a bed of hot coals to reach the couch. "I am not here on a fartball scholarship." "Kill the Alligator and Run" is the nineteenth episode of season 11. The episode originally aired on April 30, 2000. The episode was written by John Swartzwelder and directed by Jen Kamerman. 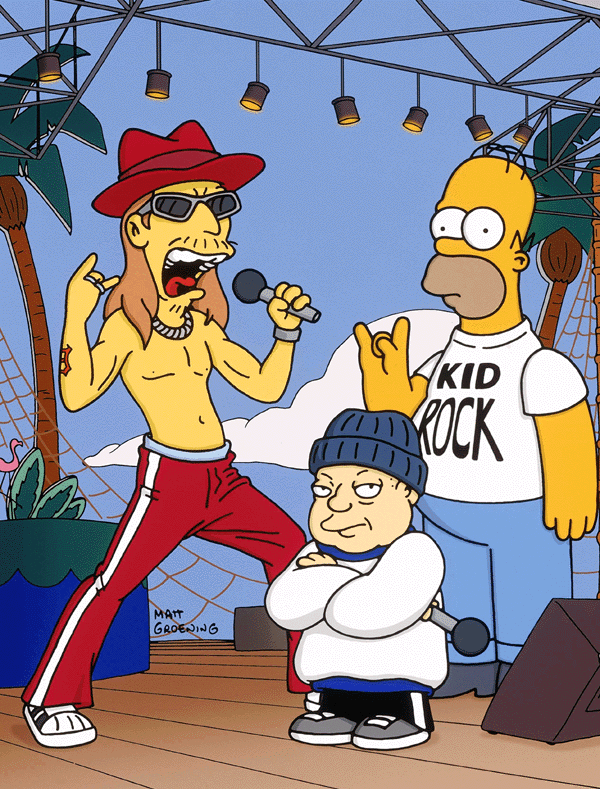 Diedrich Bader, Kid Rock, Robert Evans, Charlie Rose and Joe C. guest star. "Homer is suffering from insomnia due to stress. In an attempt to heal, the family takes a vacation to Florida. Little do they know, it is spring break when they arrive. After Homer accidentally kills the beloved town alligator, the family must go into hiding to avoid being arrested." Homer gets a magazine in the mail that's loaded with personality tests, and he relentlessly quizzes his friends and family with them. Later on he takes his own test, which determines how long he has left to live. Unfortunately, Homer's less than stellar health and eating habits add up to only three more years to live. Marge suggests a few lifestyle changes to make that number go up, naturally Homer is against that and has a mental breakdown, developing insomnia and going insane. His mental behavior almost costs the Power Plant to be closed down by asking the inspector to hide him wearing nothing but a mail sack. The power plant's psychiatrist recommends Homer go on a long vacation for quiet recuperation, so the family head off to a town in Florida. Unfortunately, when they arrive it is Spring Break, one of the loudest weeks of the year. Marge wants Homer to stay in his hotel room, but he escapes to party at a Kid Rock concert on the beach. Homer becomes the life of the spring break party. Homer wakes up the next day, rushing outside ready to party, but spring break is over: The students are returning home. Homer tries to keep the party going, dragging the family along with him. He rents an airboat and they go through the swamp, accidentally running into the town's most famous resident, an alligator named Captain Jack. Despite the fact that Homer is the sole guilty culprit, the whole family is charged for killing the alligator. They flee from the Sheriff, and their car is hit by an Amtrak train, which pushes them along the tracks. The Simpson family get off the railway and end up at a secluded diner, where they work until the sheriff tracks them down. For what they have done, the family is sentenced to forced labor. One night when they are working, the alligator appears - He had been stunned, not killed. The family is acquitted, but they are banned from entering Florida again. For their next trip, the family plans to go to North Dakota, the only state other than Arizona (which Homer complains "smells funny") in which they are allowed to vacation. In 2006, Nohomers.net named this the worst episode in the history of the show. Modified on April 30, 2017, at 04:04.